Harassed in recent weeks by bald eagles, the world's largest Caspian tern colony for the past decade "collapsed entirely" last week with the last of some 5,000 nests plundered. Repeated evening/night-time disturbances at the East Sand Island colony over the past few weeks by a bald eagle or eagles has made the terns fidgety and willing to flush frequently. When the terns take flight and abandon their nests, even if briefly, gulls that share the island have been swooping in and robbing the nests. "The real damage is caused by terns leaving their nests," said Ken Collis of Real Time Research, who is co-principal investigator for the long-running research project along with Dan Roby of Oregon State University. The lower Columbia River island's double crested cormorant colony, which is also believed to be the world's largest, has also been besieged this spring by bald eagles, peregrine falcons and great horned owls. The last remaining egg-laden nests were looted "during a series of mid-morning flushes" on Wednesday, June 1, according to information updated through June 5. "Individuals are still laying eggs, but nests rarely persist for more than 30 minutes." "Gull pressure on newly formed nests has been very intense and one individual was seen taking an egg from under an incubating tern," the June 6 update report says. The level of "disturbance" caused by the bald eagles is unprecedented, according to researchers who have been monitoring the island since the late 1990s. The adult terns being taken by the eagles are being "completely consumed" except for the wings and head, Roby said. Bird Research Northwest gathers data on the size, distribution, status, productivity, diet composition, smolt consumption, and factors limiting the size and productivity of various piscivorous waterbird colonies located in Oregon, Washington, and California. A primary goal is to evaluate the birds' impact on salmon and steelhead stocks that are protected under the Endangered Species Act. Aggregations of birds, Caspian terns and double-crested cormorants in particular, have found a home in the lower Columbia on manmade islands such as Rice and East Sand. Both islands were created with the deposition of materials dredged from the Columbia River navigation channel, which is maintained by the U.S. Army Corps of Engineers. The tern colony has grown significantly since it was first documented in 1984. Caspian terns have concentrated in the estuary because historic nesting sites have been lost elsewhere in the Pacific Coast/Western region and human-created dredge-spoil islands in the estuary offered stable nesting habitat close to abundant supplies of fish. 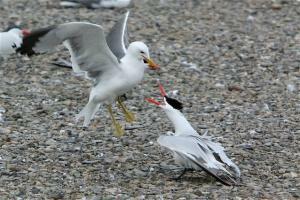 A total of 8,300 tern pairs nested at the island in 2010, which was down slightly from the 2000-2010 average. The birds wing in each spring to nest and leave with their young in summer. At East Sand they have had an average annual (2000-2009) consumption of 5.3 million juvenile salmon and steelhead, including an estimated 5.3 million last year. The proportion of juvenile salmonids in tern diets during the 2010 nesting season was 33 percent, which was similar to recent years. Researchers won't make a salmon consumption estimate until after the nesting season, but it does appear that the terns are eating more salmon and steelhead as a percentage of their diet that they do typically. East Sand island salmon consumption usually peaks at about 60 percent of the birds' diet in mid-season. But researchers this year have seen diet composition spike to 75 percent. Roby said that because of the larger than normal and continuing runoff that is flushing down the Columbia, the estuary and plume of the mouth of the river is more diluted with freshwater than usual. That could mean marine forage species are not coming within range of the terns in normal numbers, so the birds are relying more on salmon and steelhead smolts. "The estuary is not the way it normally is," because of the heavy runoff and cold, wet spring, Roby said. That high salmon rate of consumption will likely be balanced by the fact that there have been fewer terns at the island throughout the season. Counts peaked at about 12,000 terns during the second and third weeks in May, as compared to the 10-year average of 14,000 for that time frame. The count dropped from the peak to an estimated 4,100 May 31. "Colony attendance has fluctuated greatly, but many individuals are clearly still in the estuary and at least attempting to roost at East Sand," the most recent update says. The tern chick hatching season on average has been completed by the end of May. This year, the first two chicks were observed on May 31 "but both were gone within an hour," the victims of predators, the most recent update says. As of Sunday monitors could see no tern chicks on the island. "I think it would be premature to write the epitaph" for this year's East Sand tern reproductive season, Roby said. The researchers have seen chicks hatched out as late as the first half of July so persistent terns could still complete their task. "The food has to be available and the predators have to cut them some slack," Roby said. The island's double crested and Brandts cormorant colonies took a beating too in recent weeks. "Groups of eagles observed walking through the colony during the day to take cormorant eggs," the May 30 update says. Up to 70 percent of the double-crested cormorant nests west of a tower blind were abandoned, including almost all nests in satellite colonies; all cormorant nests on the rip rap east of the tower blind have also been abandoned. "Double-crested cormorants are attempting to re-nest in these areas but face continued pressure from bald eagles causing adult cormorants to flush and leave nests unattended for entire day," the May 30 update says. But, last week "disturbances were relatively uncommon" at the cormorant colony and many of the big birds began to resettle at their original site on the west end of the island and at the West Jetty, which had not been used for several years. The double-crested cormorant colony has shown steady growth in recent years and has become the island's largest presence. Last year an estimated 13,600 breeding pairs nested on the island and they gobbled up about 19 million young salmon and steelhead, according to preliminary estimates made by the research team. The research project is a collaborative project between Oregon State University, Real Time Research Inc., and the USGS-Oregon Cooperative Fish and Wildlife Research Unit. Support for this research project is or has come from the Bonneville Power Administration; the U.S. Army Corps of Engineers – Walla Walla District; the U.S. Army Corps of Engineers – Portland District; the Bureau of Reclamation; the U.S. Fish and Wildlife Service – Pacific Region, Migratory Birds and Habitat Programs; NOAA Fisheries; and the Northwest Power and Conservation Council.